Starting from as low as $1299 to move from Miami to Tallahassee (or moving from Tallahassee to Miami). Only Straight deliveries. No waiting! Moving from Miami to Tallahassee may seem like an intimidating process, no matter if you are a family or a corporate office. It is almost five hundred miles away and seven hours of driving! When you think about all the things you will need to pack and boxes to buy, and have some space in your car, you just want to forget about this headache. This is when Easy Florida Moving comes in. We are ready to take the biggest trouble of your life in our hands. Our movers do all the packing, labeling, unpacking, unloading, and assembling the furniture for you. If you do not have time to disassemble some furniture items, we will do that for you. Easy Florida Moving offers specialty items packing service, which is great for those, who own hard-to-move, heavy items. We can also store your household or office items, while you prepare your future place for a drop-off. Easy Florida Moving team can reach you fast since we are located in South Florida. We choose the location specifically to help Florida’s residents receive efficient, expedited service. Get ready for a surprise-free Flat Rate, which we establish at the time of household or office assessment. Our packing materials are always clean, nicely kept and of the best quality. We would never allow your things to be wrapped in some dirty blankets and moved around in old boxes. We are the movers who care. When we say that we will be there on time, you have our word. We would never leave you hanging since our Customer Support Team is on the phone all the time. We are Miami’s insured and licensed mover, and we are the leaders when it comes to local moving since we know Florida the best. No matter if you are moving from Tallahassee to Miami, or anywhere else in Florida, we got your back. There is no job in the world that we could not do. 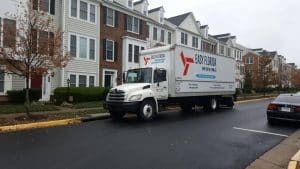 The greatest enjoyment for Easy Florida Moving comes when our customers challenge us to hard work, and we are ready to show our best qualities to you. We are dedicated to the business of moving and its industry, and we will be proud to move your from Miami to Tallahassee, FL. Give us a call for a Flat Rate Quote that will match your budget and give us an opportunity to move you! Want Flat Rate? Schedule an in-home estimate.